Home Hair Product Review Natural Hair Care Curls Whipped Cream recommended as a leave in and styling your hair!! 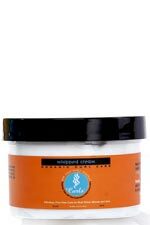 Curls Whipped Cream recommended as a leave in and styling your hair!! Okay Bellas, I did a previous review on this product back in September. I did not like the product at the time as my hair did not take to it very well. It dried out my hair!!! I only used it once before I gave it another try (I really did not want to throw away a $17 product) in November. I used it to set my twists for a curly look and I loved it. I am shouting out this product because it is GOOOOOOOOOOD!!!!!!. It does SOFTEN my hair. I now use it to do my protective styles. This product is moisturizing, it detangles ,it imparts great shine to my hair. I have no idea why it did not do all of these the first time I used it. I just feel like the overall condition of my hair has improved a great deal. I recommend this for moisturizing after spritzing your hair with water, styling, for example, twisting, braiding, roller setting ,it also makes great leave in. Oh I have to mention that it does define the curls, in other words, if you are a fan of wash and Gos, this is highly recommended!!! Just finished twisting my hair with Curls Whipped Cream. Look how juicy my twists look!! !